What are Modulate™ stretch fabric displays? Modulate™ Fabric Display Stands are a brand-new fabric display solution which fuse together the tubular structure and high definition artwork of Formulate dfabric displays with the modular design of Vector exhibition stands. Whether you’re in need of a new display for an exhibition, event, trade show, business expo, retail environment or reception area - Modulate™ Displays are an ideal solution. You can even use your Modulate™ display as an office screen or partition within the workplace. Using an upgraded version of the bestselling Formulate 30mm tubular aluminium frame, Modulate™ Tensioned Fabric Displays retain the lightweight portability of other fabric exhibition stands whilst offering unlimited layout flexibility. Patented MagLink™ technology is what gives Modulate™ fabric displays their versatility. Within the frame of the TEXstyle exhibition stands there are internal magnets which rotate 360ᵒ for ultimate adaptability. When the edges of individual fabric display panels are aligned, the magnets snap into place and instantly connect the two stands together in seconds. You can link and add panels at any angle – allowing you to create an exhibition stand that is bespoke to your brand, your event and your exhibition space. Being reconfigurable, Ultima Modulate™ Fabric Exhibition Stands are an extremely cost-effective display solution. We have carefully selected complete exhibition stand kits which are ideally positioned within a shell scheme exhibition stand space. Ensuring that our Modulate™ Displays are easily accessible, you can shop by exhibition stand size, or by shape; including Modulate™ L-Shaped Fabric Exhibition Backwalls and Modulate™ U-shaped Fabric Exhibition Stands. We also offer Modulate™ Island Fabric Exhibition Stands which are ideal for enhancing your brand awareness from all angles in open exhibition stand spaces. 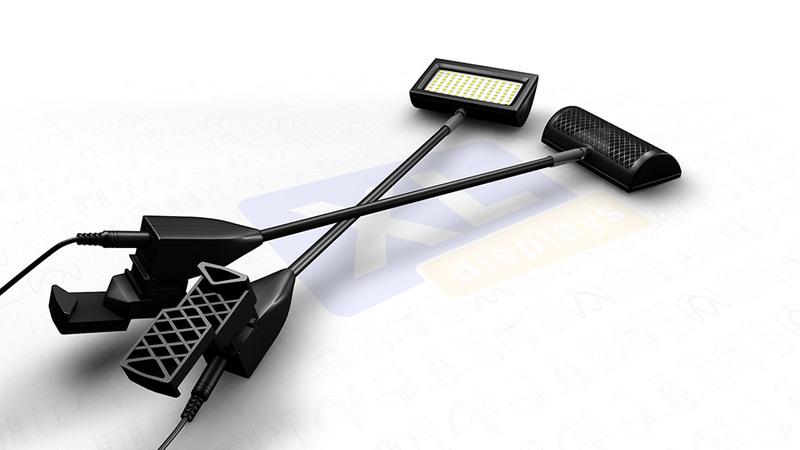 As well as our kits, we offer single Modulate™ display panels. You can select from a range of heights and widths and choose from straight, curved or sloped configurations. View our full range of Modulate™ Fabric Displays. 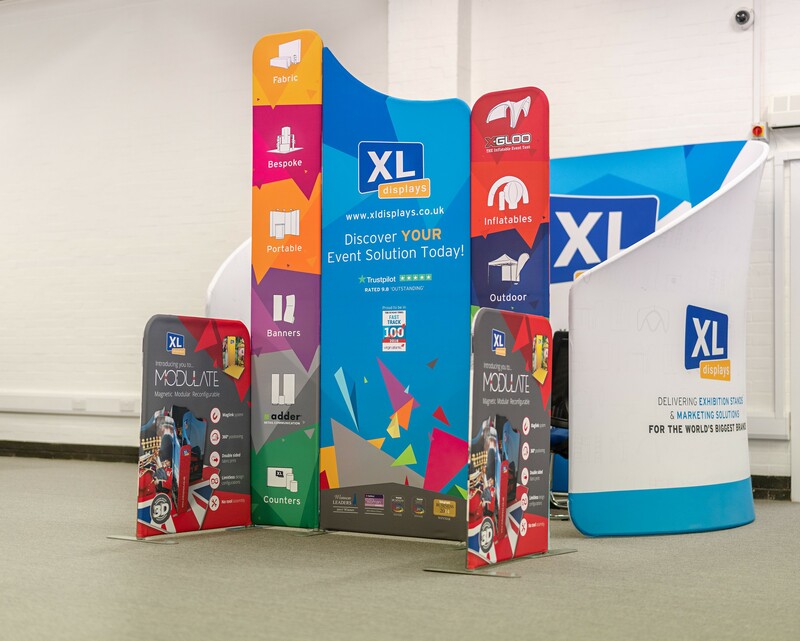 Having the option to purchase additional single panels means that you can add and adapt an existing kit you have so that your exhibition stand is able to grow alongside your business. In the same way you can add panels, you can take them away too. The integrated MagLink™ technology means that there is no need for tools or contractors when assembling Ultima Modulate™ Stretch Fabric Displays; thus saving you both money and time. Building the frame requires a simple push-fit motion. 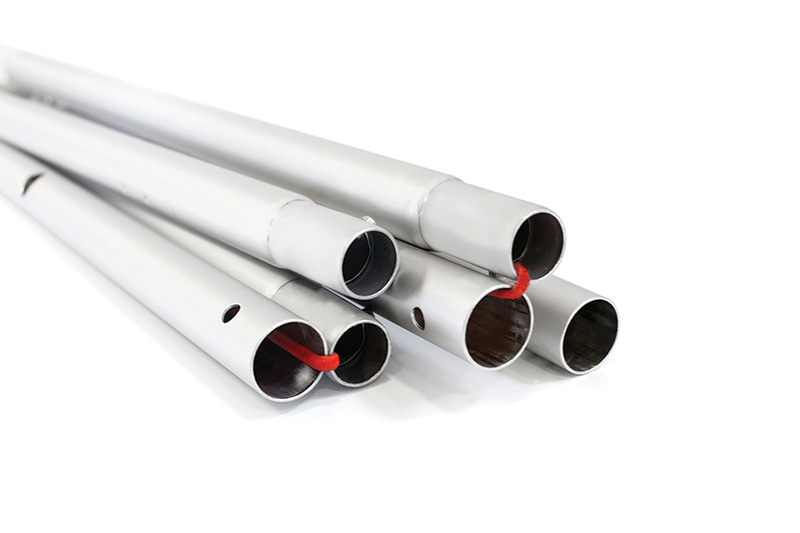 The frame is supplied in sections which are numbered and secured with a bungee cord. 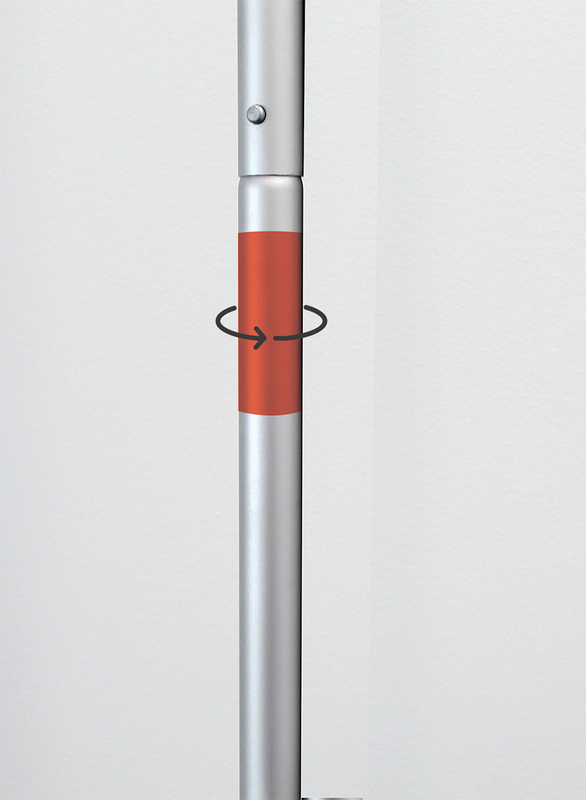 Using self-locking buttons, you simply push the corresponding sections together and then twist and lock the stabilising feet in place at the bottom. The one-piece crease-resistant stretch fabric graphic then slides over the top of the frame and zips up at the bottom to reveal a seamless, tensioned exhibition stand - it really is that easy. Each Modulate™ magnetic fabric display panel comes with its own branded carry bag. The bag features designated sections for the stabilising feet, hardware and graphics in order to maximise protection against damage. 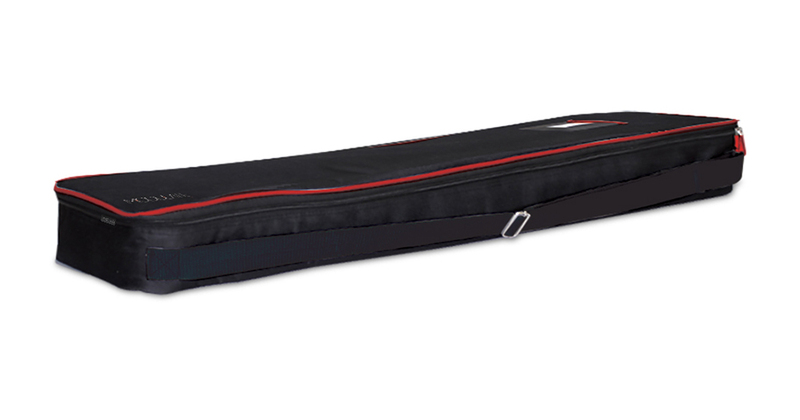 The bag is padded and has handles on the top and the bottom and one on the side, making transport between events easier than ever. Paired with the lightweight tube frame and one-piece fabric graphics, Modulate™ Fabric Exhibition Stands are effortless to store and move. We print, sew and hand finish each fabric display in-house in the UK at our print and production facility, allowing us to offer better value for money. Each fabric exhibition stand goes through our strict quality control and test build process, ensuring every display is perfectly manufactured. Each Modulate™ Display is digitally printed using a two-phase dye-sublimation printing process. This intense printing technique uses extreme heat and pressure to force the ink to bond directly with the fibres of the fabric using the Monti Antonio Sublimation Calendar. This produces permanent artwork that is ultra-vibrant and features exceptional print detail. The textile we use is 100% fully recyclable polyester fabric which is fire retardant to DIN 4102 Class B1 / DIN EN 3501. Not only that, the graphics are extremely durable and can withstand being machine washed at 30 degrees without the risk of the artwork cracking, peeling or fading - providing a display that will withstand years of use. This also means that you can keep your fabric display looking fresh and clean every time you exhibit. Much like our other Formulate Fabric Exhibition Stands, you can reconfigure your Modulate™ display to feature a host of accessories. The Modulate™ Magnetic Promotional Counter is ideal for complementing any exhibition stand. This magnetic counter features internal magnets which allow you to link multiple displays together to create a custom layout. With internal storage and a load bearing weight of 40kgs, this demonstration counter is perfect for product launches and demos, as well as acting as a meet and greet and POS area at events. Exhibition stand lighting is perfect for enhancing your display and illuminating your stand to grab attention. We offer LED Lights For Fabric Displays which simply clip on to the top of the frame and evenly distribute light whilst enriching the detail of your graphic design. LED lights are ideal for low light areas but are also a good choice to showcase a particular area of your fabric exhibition stand. 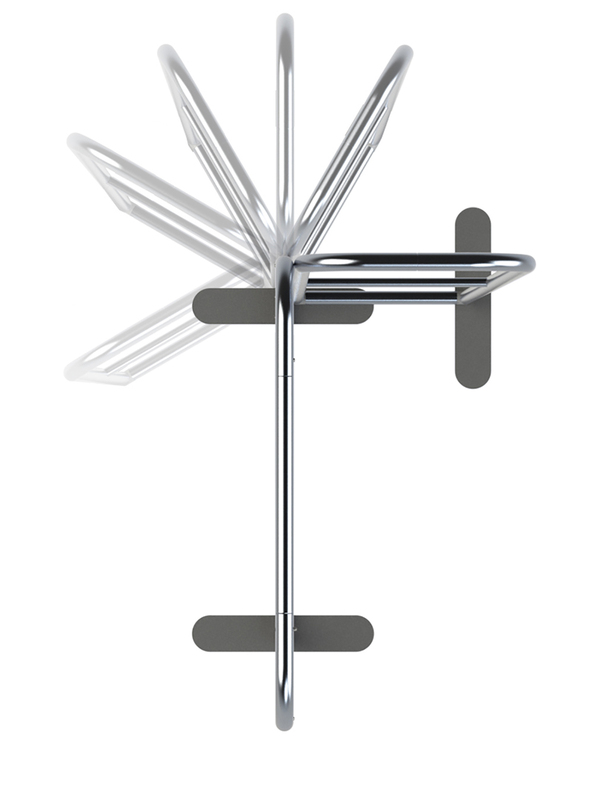 Making your Modulate™ tensioned fabric exhibition stand interactive is easy with a Formulate iPad holder. The enclosure clips on to the side of your fabric display and allows visitors to engage with your brand in a sleek yet proactive way. You can showcase literature and key marketing materials on your Modulate™ stretch display with the Formulate literature holder, or you can display small items and products with the Formulate shelf. Both clip on to the frame quickly and easily. If you’re looking for an innovative, flexible display solution that will provide you with a lifetime of use, look no further than Modulate™ stretch fabric displays. For more information on the Modulate™ Fabric Display Stand range, contact us or call us on 01733 511030.